A mother brings her 4-year-old son to your office due to the acute onset of right eyelid swelling and redness. The swelling started about 2 days ago and is worsening. The patient was wrestling with his brother 3 days prior and scratched the outside corner of his right eye. He is afebrile and denies any pain. On exam, the right upper and lower eyelids are swollen and erythematous. There is a healing scar at the lateral border of his right upper eyelid. Both eyes have intact extraocular movements. His pupils are round and reactive with no relative afferent pupillary defect. The conjunctiva is white and quiet. On vision testing, the patient sees 20/25 out of each eye. Mom reports putting some petroleum jelly (Vaseline) on the scar to try to help it feel better. The correct answer is “D.” The patient shows classic signs of preseptal (sometimes called periorbital) cellulitis. Unlike cases of orbital cellulitis, the patient is typically free of pain with normal eye movements, and shows no evidence of proptosis, inflammation of the globe (ie, no conjunctival chemosis or injection), or pupillary involvement. 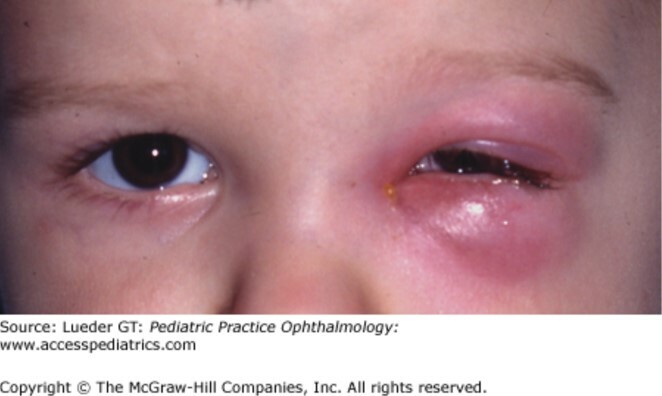 Children suffering from an orbital cellulitis are usually febrile, lethargic, and systemically unwell. Preseptal cellulitis is located anterior to the septum, which is a dense fibrous sheath that acts as a barrier between the orbit and eyelids. Three main pathways can lead to preseptal cellulitis. Inoculation following trauma or skin infection, direct spread from adjacent sinusitis or dacryocystitis, or bacteremic spread from a distant focus may precipitate cellulitis. Currently, the most common agents causative of preseptal cellulitis include Streptococcus pneumonia, other streptococcal species, and Staphylococcus aureus.